How many people does your organization help/serve? What are the demographics of the people we help/serve? How many people from your defined groups (e.g., vulnerable populations) are helped/served? How many people with certain categories of legal problems does your organization help/serve? What are the legal problems of the people your organization helps/serves? How many of your clients are served by staff and how many by pro bono volunteers? How many people is your organization unable to help (not served)? How many people are helped/served per funding source? What are the demographic characteristics (example: poverty levels and language) of the people who requested assistance and received it in the last 12 months? What about those who did not receive service? Are the proportional share of clients served by various demographics what you would expect? If not, can you explain the difference? 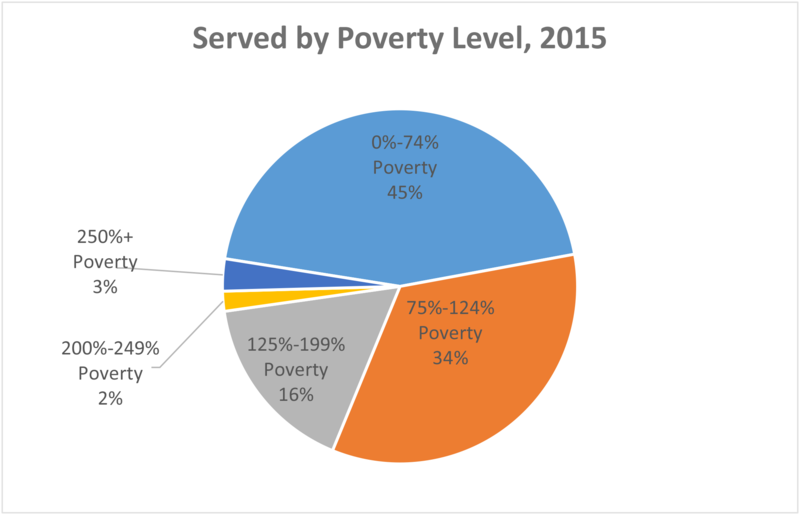 For example, did you expect that the largest share of clients receiving service would have poverty levels under 75%? Are the percentages of clients served and not served by each demographic characteristic what you would expect? If not, can you explain the difference? 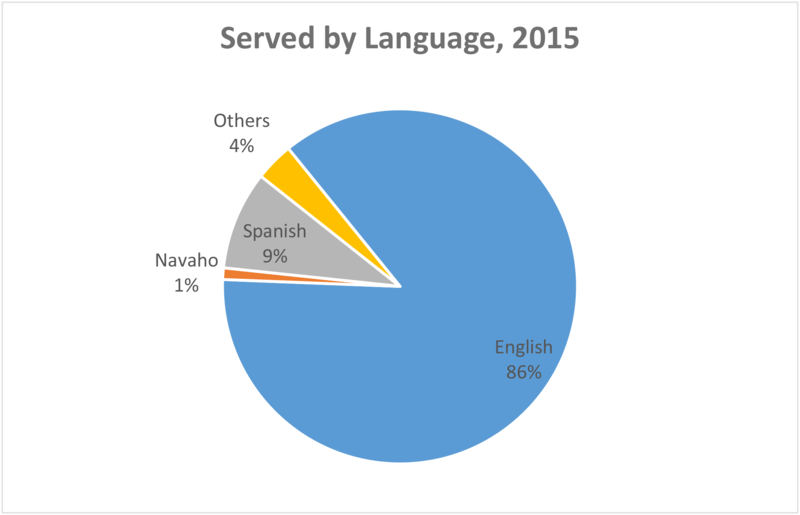 For example, were you surprised to see that non-English speakers receive service most of the time? 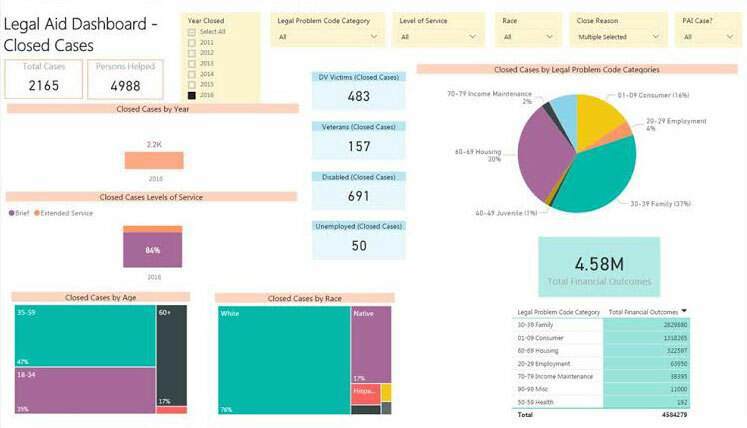 Collect information about intakes and closed cases from your CMS for the most recently completed year. Create tables, pivot tables, cross tabs, or charts within Crystal Reports, Excel, or whichever analysis software you prefer that show the count and proportions of cases served and not served by each demographic characteristic (Excel pie charts and Crystal Reports cross tabs shown in this example). Create categories, such as poverty levels so the analysis is in summary form and easier to review. Percentages should be considered together with the number of cases. A high percentage on a low number of cases may be less significant than a high percentage on a high number of cases.